With just over three weeks until Mickey Spillane’s hosts Eastchester’s Pints for Pat fundraiser, preparations are in full swing. Many local businesses have generously donated gift cards, gift baskets, and an array of services to help make the event on March 30th a success. The event, a fundraiser for the Pat Tillman Foundation, is working to raise money to help support the Tillman Scholars program. 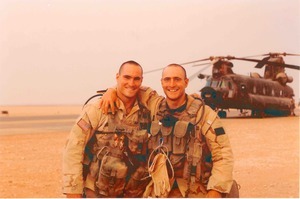 Tillman Scholarships are awarded to servicemen and women who are pursuing educational studies. The Foundation also offers networking and professional development opportunities to active duty personnel, veterans, and their families. Raffle items at the event are from a variety of familiar local businesses: gift certificates from Cornell’s True Value (Eastchester), Sedona Taphouse (Mamaroneck), Coffee Labs Roasters (Tarrytown), Benjamin Steakhouse (White Plains and Manhattan), Yoga Haven (Scarsdale and Tuckahoe), Zachys Wine and Liquor (Scarsdale) and Alamo Drafthouse (Yonkers); gift baskets donated by The Chocolate Box Café (Tuckahoe), Good Shepherd Distillery (Mamaroneck), and the Growler & Gill Craft Beer Shoppe and Tasting Room (Nanuet); and sports-themed baskets featuring the NY Giants and NY Yankees. The Hudson Valley Renegades have also contributed to the cause, donating tickets for a date of the winner's choosing during the 2019 season. Silent auction items will include a spa package donated by Scarsdale’s Tranquility Spa and a foursome of golf at a private country club in Greenwich, Connecticut. One of the most unique features of Pints for Pat events is the 20-oz Imperial pint glass, engraved with Pat Tillman’s #42. The glass, a replica of the one Tillman used at the Rúla Búla Irish Pub in Tempe, Arizona, is free with the first 50 tickets purchased. Additional glasses will be available for purchase at the event. In addition to access to raffle and silent auction items, attendees will enjoy two hours of food and drink (beer/wine) and entertainment provided by Tom Pescé. Mr. Pescé, who resides in Ridgefield, CT, is a magician with twenty years experience. Recently Mr. Pescé performed at the Mohonk Mountain House resort in New Paltz, NY and the Woodloch Resort in Hawley, PA. He will be performing in Clearwater Beach, FL, in late April.